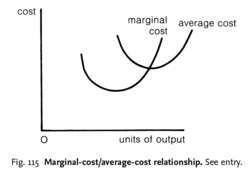 the mathematical relationship between MARGINAL COST and AVERAGE COST. See Fig. 115 . When average cost (AC) is falling, marginal cost (MC) is always below it; that is, if the cost of an extra unit of output lowers AC, it must itself be less than AC in order to drag the average down. When AC is rising, MC is above it; that is, if an extra unit of output increases AC, its cost must be more than AC in order to pull the average up. The MC curve cuts the AC curve at the minimum point on that curve, as shown in Fig. 115.